Katsu, a fried cutlet made with crispy panko breading, was introduced in Tokyo in the late 19th Century. Meant to mimic European fare, it was adapted, adopted and enshrined as a Japanese comfort-food favorite that has come full circle with its growing appearance on American menus. The reasons for its globe-hopping appeal are obvious: Like its culinary cousins Milanese and schnitzel, katsu is tasty, satiating and, especially here in the United States, unlikely to be made at home. Importantly, it adds another option to an operator’s sandwich arsenal and allows contemporary chefs plenty of room for innovation. Satisfying sandos. In Japan, tonkatsu sandos, or pork katsu sandwiches, are ubiquitous; in the U.S., they’re a starting point for invention. San Francisco’s ’Aina, a modern Hawaiian eatery, dresses its version with fermented cabbage, kimchi aïoli and namasu, a type of Japanese pickle. At Pao by Paul Qui in Miami Beach, Fla., the Katsu Sando is served on pan de sal, a Filipino bread roll, with karashi mustard and sweet-and-sour fruit sauce that’s common on tonkatsu. Wagamama's Ebi Katsu appetizer: fried prawns in a spicy garlic-and-chile sauce. Like its cutlet counterparts, katsu is compatible with many proteins. Chicken is predictably getting lots of play, like the Chicken Katsu Sandwich at E&O Kitchen and Bar in San Francisco made with tonkatsu glaze, spicy mustard aïoli and coleslaw and served with root vegetable chips. Last year, the Lakewood, Wash.-based Ram Restaurant & Brewery chain scored a home run with a promotional Chicken Katsu Sandwich made with katsu sauce, Asian slaw, spicy sweet-and-sour cucumbers and sambal aïoli on a brioche bun. Down the coast at a “down-to-earth burger joint”, Humble Potato in Los Angeles provides a Japanese flavor twist with the Katsu Kare Sando served with slow-cooked curry and yuzu-jalapeño slaw. Happy-hour imbibers at Tsubaki, a classic izakaya, or tavern, in Los Angeles, can enjoy a Chicken Katsu Sando made with fried chicken thighs on Yamasaki milk bread garnished with onion rings. Orsa & Winston is also in Los Angeles and also puts its Chicken Katsu Sando on milk bread. This super-soft Japanese bakery staple is an important sando component, and connoisseurs consider pillowy, untoasted white bread with the crusts removed a key indicator of authenticity. Wagyumafia. A Tokyo restaurant with that notable name has announced plans to open an outpost in New York City, where it will offer its signature $180 wagyu beef katsu sando. Wagyu, the prized, pricey and highly marbled Japanese beef, has already turned up on sandos here, as at Grass Skirt in San Diego, where it comes with curry aïoli, and at Katsu Sando, a Sunday pop-up at various locations in West Los Angeles, where it comes with tomato purée. A beefy alternative to Wagyu is the Skirt Steak Katsu at Here’s Looking at You in Los Angeles. The brunch feature is served minus the bread, plus fried eggs, hash browns, ’nduja gravy and pickles. On the subject of beef, it was probably inevitable that the Japanese sando would be hybridized with the American burger. The result of this mash up is five-unit, Seattle-based Katsu Burger, which menus nearly a dozen varieties of its eponymous specialty and boasts “deep-fried goodness” in options like the Tokyo Classic Burger made with grass-fed beef katsu, tonkatsu sauce and Japanese mayo. Non-carnivorous patrons can also indulge in some of that promised goodness with the Miso Honey Tofu Katsu Burger fried in eggless tempura batter. Entrée origins. Despite the current growth of and attention to katsu as a sandwich filler, the item actually began life as a main dish. Gurunavi, a guide to Japanese cuisine and restaurants, describes a range of katsu entrées like katsudon, or rice bowl, and katsu curry made with sweet and mild Japanese curry sauce and served over rice. Katsu is also popular in pre-plated convenience meals and bento boxes. Katsu appears on the center of the plate stateside, too. American Fork, Utah, seems a fitting headquarters for seven-unit Mo’ Bettahs, which dishes up Hawaiian-style Chicken Katsu with a side of rice and macaroni or tossed salad. 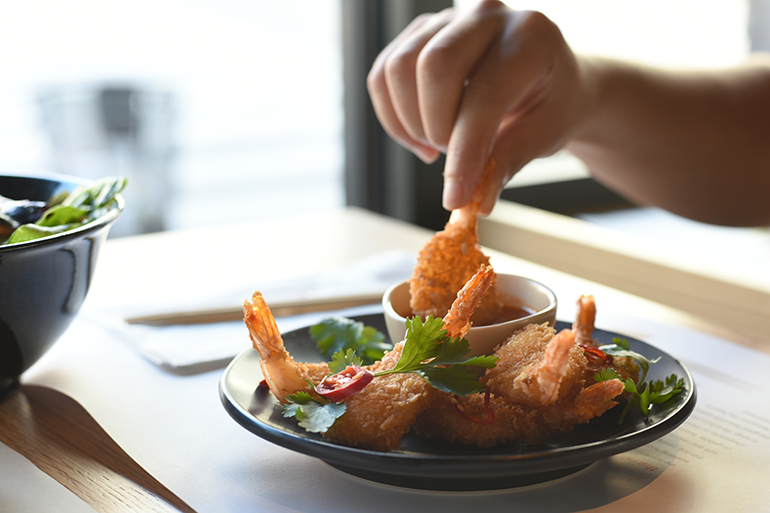 Wagamama, the United Kingdom-based Asian noodle chain with five stores in the U.S., proffers an appetizer of Ebi Katsu, fried prawns in a spicy garlic-and-chile sauce. And in a sign of the dish’s crossover potential, meal-kit specialist Blue Apron makes a Katsu-Style Catfish kit available to subscribers. Accompanied by black-garlic dipping sauce and a side of savory marinated cabbage, it uses the cutlet to coax American cooks back to their kitchens.